A surprise visit from Graham Hnatiuk caused the script to go out the window for Episode 3, as the civic issues of panhandling, homelessness, and public safety in and around downtown forged to the front of the line. Graham was a regular contributor about urbanism on our radio version and it was great to have him join in again. The Downtown Biz wants to paint a rosy picture that doesn't do justice to the injustice of how unsafe the city is when cruise night winds down. How dangerous is Marty's perception of downtown Winnipeg on a Sunday night? Plenty. How upset was Graham with the Winnipeg Sun? Plenty. How embarrassing is it that the pet project of millionaires can't pay its taxes ? Plenty. This afternoon, I am writing to advise that Alex Robinson is leaving the Winnipeg Public Service leadership team to seek other career opportunities, effective today. Once a member of the former Business Liaison and Intergovernmental Affairs Department, Alex returned to the City of Winnipeg in November, 2005 as an Advisor in the Executive Policy Committee Secretariat, moving into the role of Senior Advisor in December, 2006. Alex took on a new challenge in September, 2007 when he was appointed Acting Chief Administrative Officer. In April, 2008 he was appointed Mayor’s Director of Economic Development and Strategic Initiatives, and was responsible for a comprehensive intergovernmental relations strategy and the review of high profile, strategic initiatives. In November, 2008 Alex was appointed to his most recent position of Deputy Chief Administrative Officer. Those who have worked with Alex know him to be a leader with tremendous skills and the ability to develop strong relationships. On behalf of the City of Winnipeg, I would like to thank Alex for his many contributions to our City. We will miss his commitment and loyalty to the organization, and I know his colleagues and many friends wish him the very best as he prepares to take the next exciting step in his career. Welcome to our new readers, from media outlets, colleges and universities, and government agencies across Canada! We are the alternative media leader, giving a voice to those who have views that challenge the established political interests and hold to account, the mainstream media that has abandoned their role as watchdog for the public interest on many issues. If Winnipeg had radio that mattered, this would be it. Fan reaction to Podcast launch; New episode explains the NDP jumping on the Jets bandwagon, candidate interview, book contest, and more. Enjoyed the podcast. You did a great job. I was surprised how professional the sound seemed done from a Mac and Microphone. The good: Updates on the blogosphere, I know some of them but learned some new ones, Selinger/Flanders comparison, crime court and public safety, shout outs and finding out what past TGCTS staffers went on to do. The Bad: nothing really. - I think that finding a way for the live audience participation is a good idea. I even found something to disagree with. Sorry, I'm really skeptical about the Jets. It seems that this is a sop to the masses to distract us from the issues (like crime, healthcare and infrastructure). Circus Minimus while Rome burns. Middle class gets to spend incredible amounts of cash to watch upper class play game to benefit upper class assuming they can get tickets. I really hope I'm wrong (and will freely admit it should it be a monster success) but I have a hunch that once the honeymoon is over in about five years we can all go down to the Forks and have another save the Jets rally. Maybe Premier McFadden can reprise Gary Filmons role. I'm in the minority on that one and again I hope that I'm wrong. My wife comes home at midnight and was accosted in our parking lot. Glad to hear the bike lanes are not a dead issue. I drive to work every single morning down Bannatyne towards HSC at around 7am and home again up McDermot at around 4pm. At the height of the summer I see maybe two going to work (seems to be the same two) and two or three on the way home. And in winter the lanes are filled in anyway forcing them into one of the only two remaining car lanes. Here's an interesting thought. I've noticed cracks in the asphalt seem to be getting wider, particularly McDermot towards the HSC end. When they put the bike lanes in they moved over the car lanes. It seems that when the road was designed, it was designed to handle the load for the lanes that were originally installed. Now motorized traffic straddles these original lanes and there seems to be separation in the asphalt. Did anyone think of the implications to the infrastructure by moving these lanes over in such a fashion? Are we causing more damage to the roads by doing this? I'm no engineer but it's an interesting question given what I'm observing. I wonder what McDermot will wind up looking like after a few freeze/thaw seasons. All that and the Fiends of Upper Fort Garry got a mention too. Speaking of the Free Press - Did you read the review that Marion Warhaft gave the FP cafe? Four stars of course! No conflict of interest there! Look forward to the provincial election. @TGCTS LOVED it! Great to hear you again, and you're right, Ned Flanders IS more exciting than Selinger! Great job Marty! When are you planning your recordings? If it's not between 9 a.m. and 7 p.m. on weekdays, I can offer my services as a U.S. commentator. You saved the Dr pepper This Long? - and a contest to win the autobiography of UFC ref Big John McCarty "Let's get it On! ", written with frequent TGCTS guest Loretta Hunt - I was sent a review copy by mistake so I'm paying it forward, with the proviso the winner writes a review for use on a future Podcast. Podcast episode 1: How electable is the unelected premier, Greg Selinger? Our inaugural podcast is TGCTS at its best, including going into overtime cause there was so much to dissect on the local scene -- especially when Spirited Kenny is in the studio. Who's more exciting, Greg Selinger or Ned Flanders? Kenny decides. It's a fun kick-off to Winnipeg's premiere podcast with a review of how the leaders debate at the Teachers Society unionista gathering sounded on CJOB and the on-site reaction to the saturation bombing of Tory ads on the broadcast. We also put out the call for tips about the Manitoba election - (dirty campaign tricks to report? tgcts1 at g mail dot com folks!) and set out the first plank in what we think should be an election issue -- Sunday shopping. Also there's a Crime Courts and Public Safety update with a tremendous assessment of the abandonment of the north end from Rae Butcher, plenty to say about Winnipeg radio, newspaper and TV reporting, recommended blogs to read, and innumerable shout outs to all sorts of Winnipeggers who have supported our work. Hint: some of them went to Red River College. We even try out the new Old Dutch chip flavour, Sweet and Sour. All that and more in Episode 1, just follow the link below. Margo, pass Stephanie some Rolaids. The gatekeepers of the Winnipeg mainstream media tried to use their power behind closed doors, to cancel our drive-home talk show, and then lies were told to cover up the actions of "role models". Because we made a difference and shook up the status quo, that's why. Our civic election coverage proved, there was a silent majority in Winnipeg who want their stories told about this city, that want to hear the views and analysis of bloggers and the alternative media, are interested in the concerns of small businesses and non profits, and wanted the voiceless defended. It accomplished what the Democracy Project is now trying to - we got people engaged, gave candidates a chance to address issues and for the public to know them, and made voting important. Thousands of Winnipeggers want real issues covered every day, and to hear politicians and bureaucrats - and the newsrooms covering them - held accountable, and exposed when they failed the public interest. Thanks to modern technology, beyond the reach of Margo Goodhand and the Winnipeg Free Press and immune from political pressure tactics, YOUR VOICE will again be heard. Next week regular podcasts of The Great Canadian Talk Show, about an hour in length, is going to be launched that will include the Crime, Courts and Public Safety Update, brought to you by the Winnipeg Police Association. Spirited Kenny is hard at work on the technical details to get the Podcast ready for smartphone and online access. Check this blog daily for that audio as well as evening / overnight updates and special segments. Along with the usual topics of interest - (hello, bike lobby; how ya doin' Manitoba Hydro? ), the provincial election is front and centre. We'll interview candidates, go inside the campaigns, and ask the questions voters want answered. And if anyone sees, knows, or hears about ANY dirty tricks on the campaign trail, any allegations of breaking the election rules, we want to know. This time, when we report on those complaints, no one can cancel us. A prominent news story all about her 'big plans' for Red River College, and a much smaller companion piece in this morning's Winnipeg Free Press - with a vague headline and no byline - has generated the kind of attention Stephanie Forsyth would prefer to avoid, as readers look past the PR spin and towards her controversial management style and priorities. The RRC president made clear her facility envy of local Universities, as she told a remarkably uninquisitive Nick Martin how the College wants to add lights and astroturf to athletic fields, wants an indoor soccer facility, and covets the decrepit Public Safety Building, even if the main Notre Dame campus infrastructure is "in dire need of replacement", and the Union Bank Tower project is "a little behind schedule, not unexpectedly when it's a 1903 building." She also promised to create a new administrative position answering directly to her, apparently to be responsible to facilitate her pet project of increasing Aboriginal presence in the institution. How any of this would help cut the 2-3 year wait lists for current courses or reduce rising course costs for students is unclear. Trying to recast herself as a conciliator, Forsyth asked "How do we develop more of a sense of community, a campus that's welcoming to students and the public?" Well, coming clean on her role in the illegal plan to eliminate all community programming from the campus-funded Kick-FM might be a start. And now she may not have a choice, after Advanced Education Minister Erin Selby replied to a complaint by telling a listener to take it directly to The Board of Governors, which he did very early this morning. The listener filed notice with Forsyth's bosses that he wants an investigation, after Madame President ignored his complaint when he caught College officials trying to cover-up the facts behind The Great Canadian Talk Show being axed. "I have been advised by the Minister for Advanced Education, the Hon. Erin Selby, to go directly to the Governors with my complaints about College employees. She assured me it will be investigated by you using the established College processes. I am bringing forward formal complaints about the unethical conduct of Dean of Business Graham Thomson, and vice-president Ken Webb, in relation to being misled and treated with contempt, and then ignored when I tried to file a complaint about being lied to. 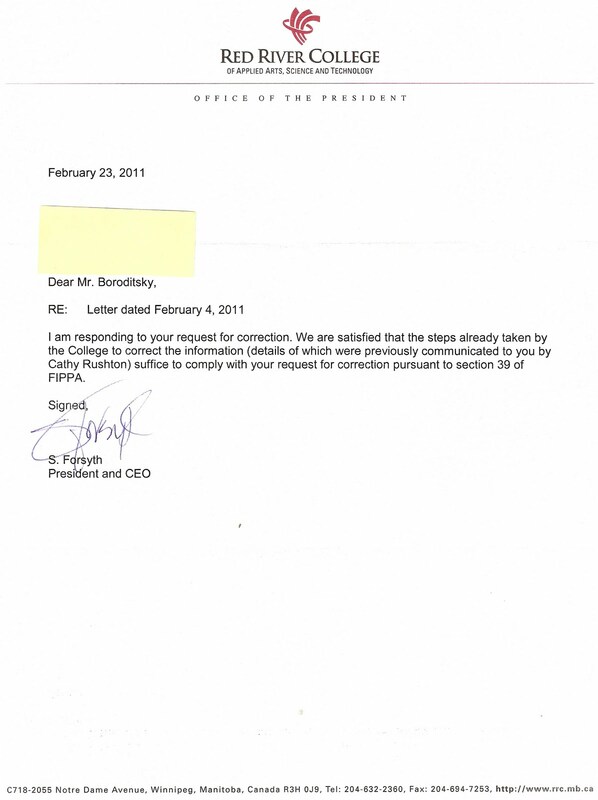 I am also filing a formal complaint against President Stephanie Forsyth, who failed to acknowledge my complaints against Thomson and Webb, or take any action to investigate when I brought it to her attention. As a taxpayer, the dismissive attitudes and evasive responses I have encountered from your employees have been utterly unacceptable." Meanwhile, in a separate story "New president fired senior staff", the newspaper of record has finally reported on the firing of two senior RRC administrators two months after the blogosphere did, adding details to Forsyth's actions but no insight into why. Forsyth refused to discuss personnel issues, saying only, "Positioning the college for the future, I felt that was necessary." Rushton could not be reached. Olson, who was a senior administrator at Red River for almost 10 years, said there was no forewarning the two would be fired an hour apart on May 27." The story, by "staff writer", failed to tie together the obvious clue that escaped Nick Martin, which might help explain the mystery of the cancellation of the vice-presidents' employment on short notice. With the project over-budget and behind schedule, maybe the Free Press could have asked Forsyth who at the College was responsible for those aspects of the Union Bank Tower project ? Forsyth has done some pretty awful things since her arrival. Perhaps the article should dig more about the illegal operating tactics of the Kick FM Board at the College, the current Human Rights complaint that has been filed, how Forsyth and her cronies lied to the public, shut down a major fundraiser for a not for profit agency, and now, refuse to answer any questions. Oh yes, and Stephanie is allowing her name to stand for a seat with the Winnipeg Chamber of Commerce Board of Directors? Speak with your votes people." @progwinnipeg still this is the first I heard, of Rushton's firing. Stopped following the whole TGCT saga a while ago. Very pleased. @progwinnipeg now if they got rid of Forsyth I would go back to considering RRC a decent place to learn. @progwinnipeg until then there's direct evidence of a double standard between taught ideals and the practices of the faculty. @progwinnipeg well it was some good news. So thanks for reporting on WFP NOT reporting it haha. If Forsythe can rationally support her behaviour, she should do so in the name of transparency and accountability. Ethical decisions are comprehensible, unethical ones are incomprehensible. Welcome to our new readers from colleges and universities across the country, including the Ontario College of Arts and Design, the University of Waterloo, University of Lethbridge and Northwest Community College. We are interested in more of your comments about our stories and investigations, especially if your campus funds a radio station licenced under the CRTC. 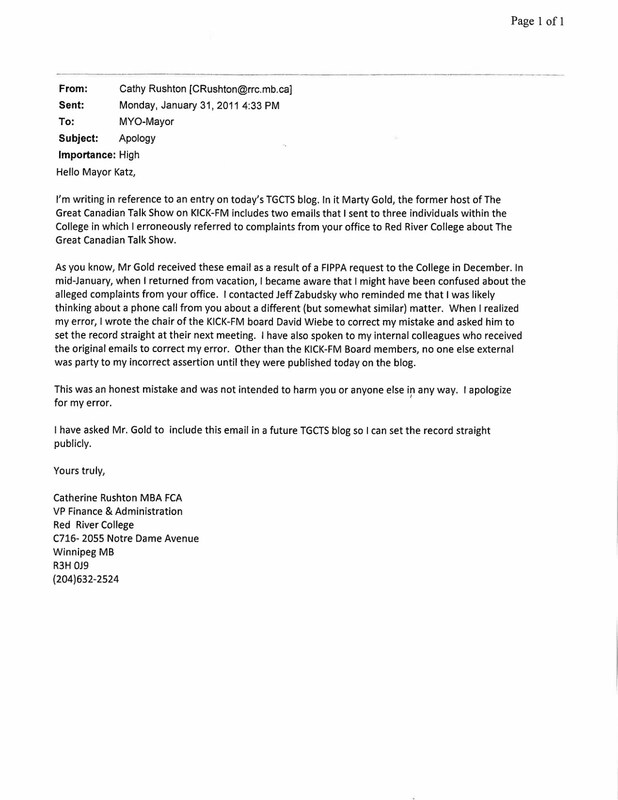 Rushton, who admitted to blogger Graham Hnatiuk that she "was confused and incorrect" when she spread the falsehood to College and Kick-FM officials that Katz had beefed about "attacks" on our radio program, was no less confused and incorrect in her "apology" to the Mayor. - The "incorrect assertions" were made to 4 College officials, not 3. 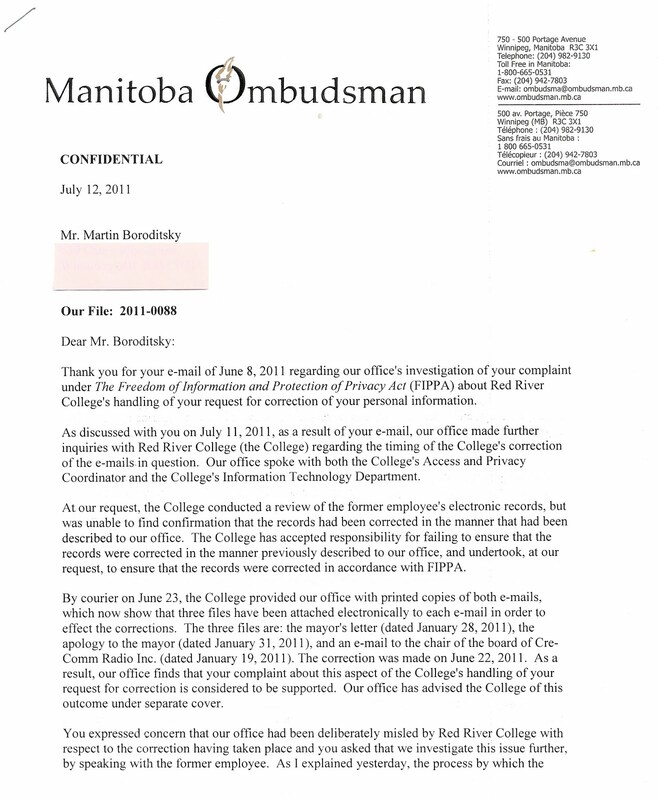 - There was nothing "somewhat similar" about the reason Katz called RRC president Dr. Jeff Zabudsky that would explain her connecting the call to Marty Gold. The Mayor complained to Zabudsky about a College employee and his blog posts. That is entirely different than "someone never employed by the College with a radio show". - Rushton denied intending any harm Katz or to our work providing a platform for community talk radio on behalf of the station. She used the phrases "ragging " and "soap-box" to describe our coverage of the public's concerns about City Hall in conjunction with repeating the false allegation and blaming Marty Gold for the Mayor being riled up at RRC. You decide. 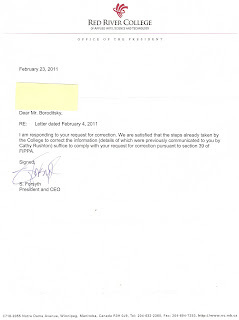 - Contrary to what she told Katz, Rushton never asked Marty Gold to publish the email in a future blog. 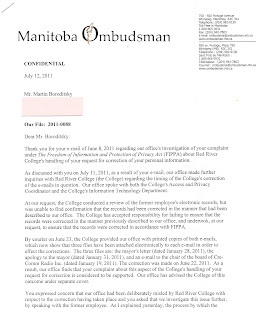 In fact, it was only through discussions with an investigator from the Ombudsman's Office, that it was learned an apology had been sent to Katz at all. 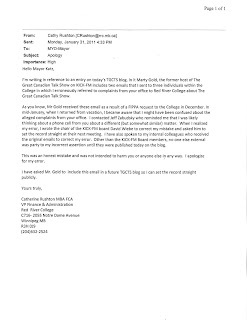 Left unexplained is why Rushton wrote an "apology" to Kick-FM Board czar David Wiebe on January 19th, yet did not say a peep that she had "determined that my memory was faulty about this phone call" to Marty Gold and Sam Katz first. It was only after this blog exposed her use of the false allegation to justify canceling The Great Canadian Talk Show that Rushton contacted them, 12 days after her email to Wiebe.